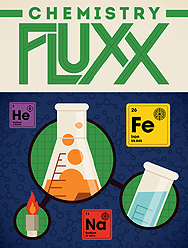 Chemistry Flux is the elemental card game where the rules are always changing. Chemistry Fluxx is the perfect compound of chance and skill - use atoms and laboratory gear to match the current goal and win! Chemistry Fluxx is so much fun, you'll be playing it more than just periodically!